You are here: Home / News / Car Reviews / 2017 Skoda Kodiaq review: just another SUV? 2017 Skoda Kodiaq review: just another SUV? Don’t groan yet. Yes, here we have yet another SUV. Or ‘crossover’ – call it what you will. From some angles, the Kodiaq is simply a generic 4×4. It can be difficult to discern Skoda’s “celebrated design language”, although the squared-off wheelarches are, apparently, a clue. This is Skoda’s first foray into the middle reaches of the SUV world. It’s already had much success with the smaller Yeti, which really did have standout styling. Even if you didn’t like the look of the Yeti, there was no ignoring it. 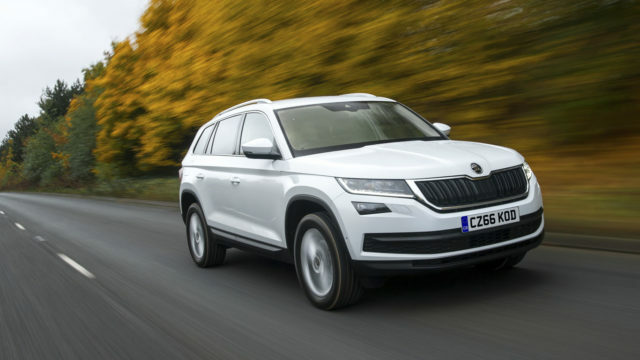 With the Kodiaq, Skoda is playing safer, not least because this is a seven-seater that needs to work as well outside the school gates it does at the garden centre. Yet you can buy one for less than £25,000. That’s strong value, but only what we expect from Skoda. Boulevard cruiser or genuine off-roader? There are a couple of clues here. 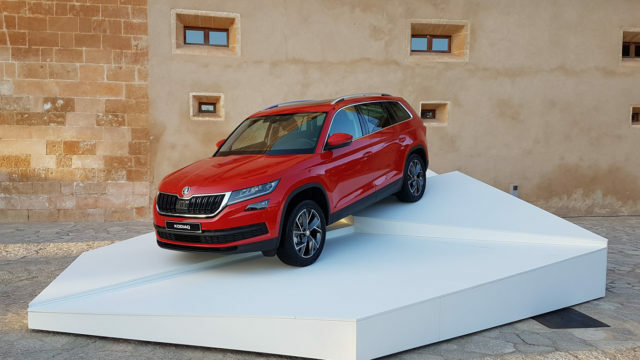 On the launch in mountainous Mallorca, Skoda only wanted us to drive the Kodiaq on Tarmac. 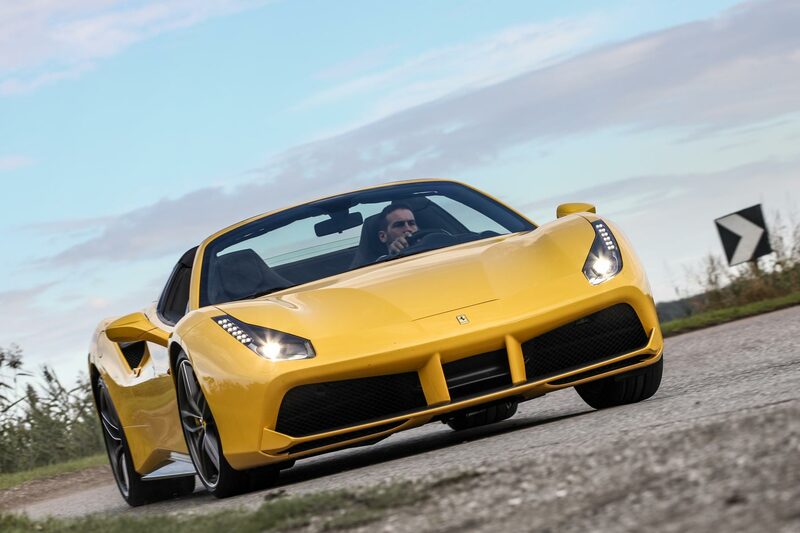 And nearly half of the astonishing 34-model range doesn’t have four-wheel drive. So let’s be generous and assume that we are looking at a car that will cope well with mud, gravel and small rocks, rather than the extremes that Land Rovers excel at. And that’s precisely what most buyers of modern SUVs are looking for. Smart technology can now give the traction and reassurance to suit most conditions, and the truth is a good set of winter tyres will be as effective in snow on a front-wheel-drive Kodiaq as the standard tyres on a Kodiaq 4×4. What does the Kodiaq bring to the SUV game? The truth is, not very much. 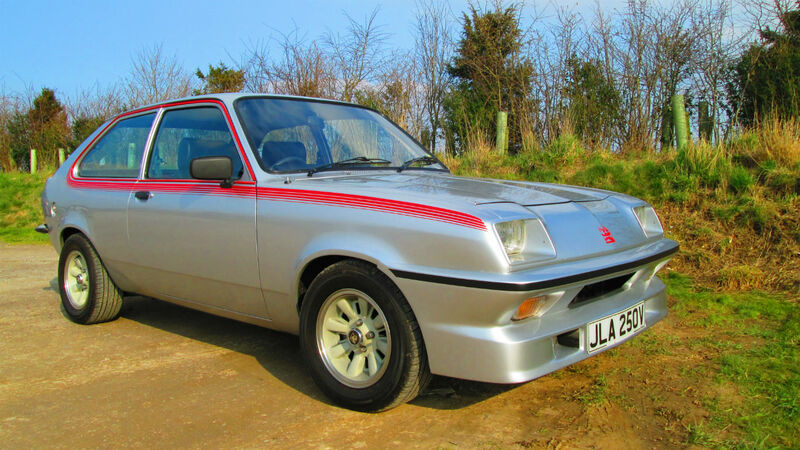 It’s a reasonably good looking car, and with different badging we bet most people would believe it was a Volkswagen, not a Skoda. That’s, of course, a good thing in many ways, despite the Dieselgate scandal. Mechanically, the Kodiaq simply raids the engineering that you already see in countless VWs, Audis and SEATs, which means it’s fully developed right out of the box and as advanced as it gets in this price range. The prices do look very competitive, too. A budget of £23,495 gets you into a seven-seat Kodiaq, with more powerful 4×4 versions starting at £26,445. The Kia Sorento costs more, and the Hyundai Sante Fe very much more. Can you buy a desirable Kodiaq that cheaply? We’ll come to the petrol/diesel discussion in a moment, for that adds yet another dimension to the choice. It’s true that the cheapest Kodiaqs won’t be fast, but the equipment is reasonable even on the ‘S’ version, which comes with air conditioning, alloy wheels, a leather steering wheel and DAB radio with smartphone connectivity. Just £21,495 gets you into the 1.4 TSI S, with a 125hp petrol engine, front-wheel drive and five seats. 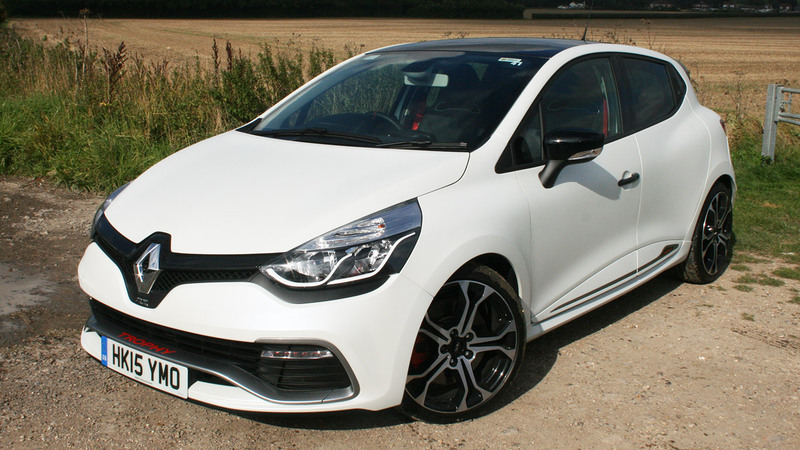 A more powerful 150hp version of that engine, coupled to four-wheel drive, seven seats and SE trim is £26,445, or £27,445 with an automatic gearbox. That’s strong value, taking into account the added niceties you get in the SE. 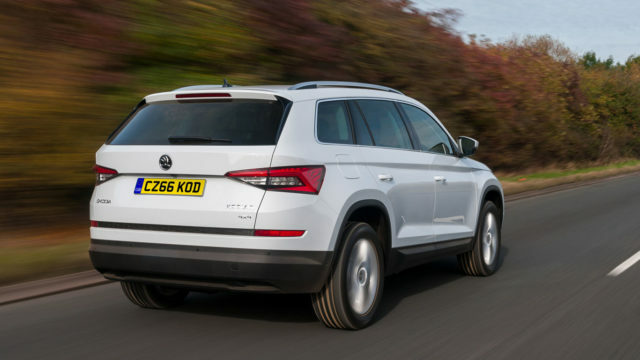 Diesel models cost £1,800 more and, initially, when the Kodiaq goes on sale in early April 2017, the 2.0 TDI SE 4×4 five-seater will start the range at £27,245. 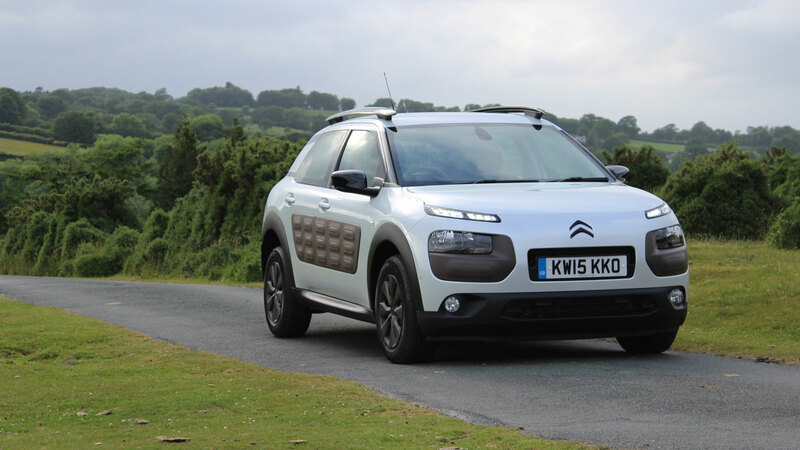 In time, there will be lower-powered diesels, with just front-wheel drive, from around £23,500. Traditionally, sales of SUVs this big have been dominated by diesels. 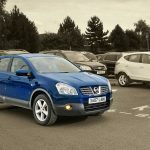 As petrol models offered neither the economy nor the sheer pulling power of a diesel, buyers weren’t keen, even though there was a price premium for diesel – often in the region of £1,500. Today, though, diesel-engined cars have become so tainted that their pollution levels may eventually kill them off entirely. Skoda is thus fortunate that the Kodiaq’s chassis can take a whole assortment of engines from the wider VW Group, which means it’s straightforward to ring the changes. Rivals Kia and Hyundai have far fewer options. The choice is straightforward, although still not easy. 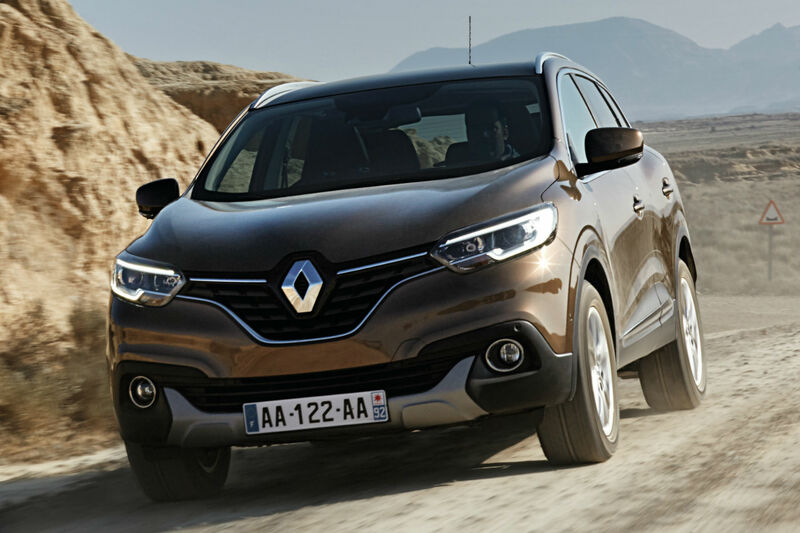 The familiar 2.0-litre turbodiesel engines combine the expected easy drive with reasonable refinement. The big surprise is the 1.4-litre petrol models. With a turbocharger to help slug it out against the diesels, the 1.4 TSI with 150hp proves an enticing car to drive: smooth, refined and with strong performance. We suspect that only when fully loaded would you crave the extra thrust of a diesel. That still doesn’t get around the economy issues. There’s no escaping the fact that a petrol engine in a big car like this will not give anything like the same economy as a diesel. The statutory tests suggest that you’ll still get 12mpg more from the 2.0TDI over the 1.4TSI with the same power. That closes the gap, but it’s still significant. In the end, the decision is yours alone. It’s not an easy one. Does attractive pricing mean you miss out on quality? It certainly doesn’t feel like it. The Kodiaq looks solid and well-built from the outside, while the interior has a feeling of Volkswagen class and quality. Many rivals don’t measure up to the Kodiaq’s standards here. In the front, the Skoda is roomy and comfortable, with plenty of adjustment to the seats and great visibility. The second row offers plenty of space, although the seats are flat and shapeless – the same as in the third row where legroom is, unsurprisingly, more suited to kids. Here the Kodiaq scores highly. Like every Skoda, there is a no-nonsense approach that will appeal to many. 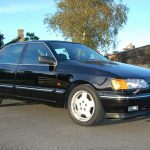 Yes, you can pay extra for endless technical options, but the core offering is a sensible, solid vehicle that covers all the bases in a honest manner. Victor Meldrew would love it. There are plenty of places for odds and ends, the rear seats recline, and a host of electronic safety aids protect you and the occupants. 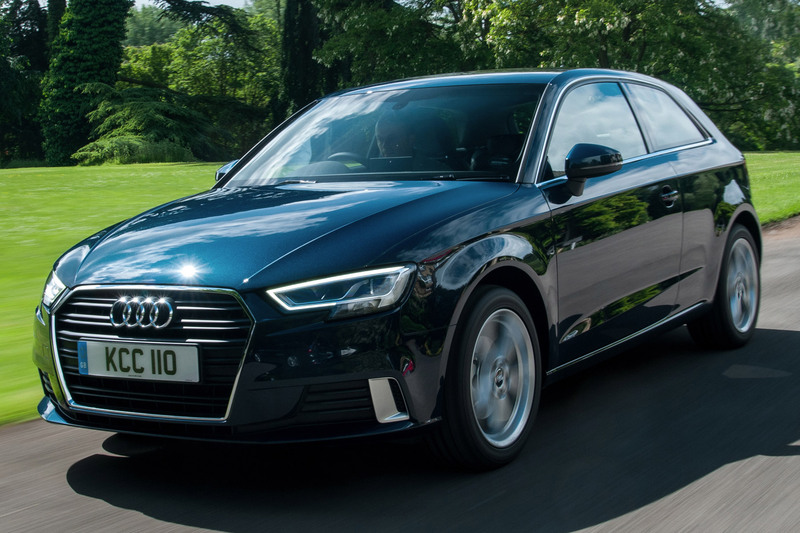 With three Isofix fastening points for child seats and a 720-litre boot volume (that means huge) in the five-seat version, it’s a great family car. All the rear seats readily cantilever forwards to give a flat floor. And umbrellas come built into the front doors! It should be, although we’d be surprised if anyone went for a petrol model if towing was part of their plan. Skoda has thought this through too, with the clever Tow Assist option. 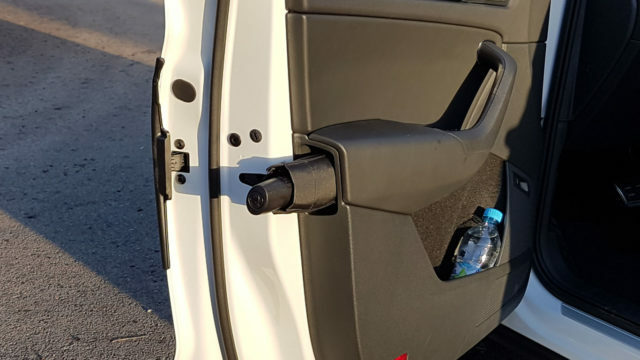 This can do a hands-off reversing manoeuvre to slot the trailer just where you want it. Except in practice it isn’t that straightforward, and takes some trial and error setting up. There’s another towing issue hidden deep in the small print. 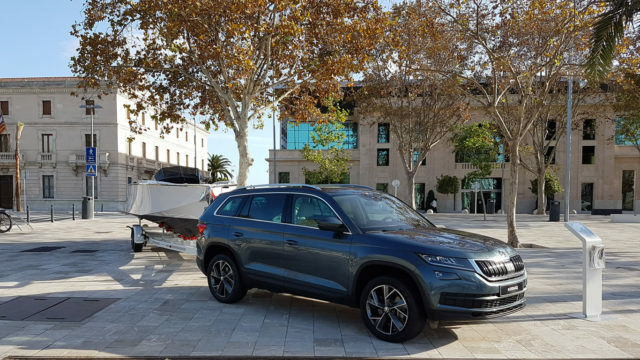 While the five-seat model has a towing capacity of 2,500kg and a nose weight of 100kg, the seven-seat models are restricted to 2,000kg and 80kg nose weight. Odd. 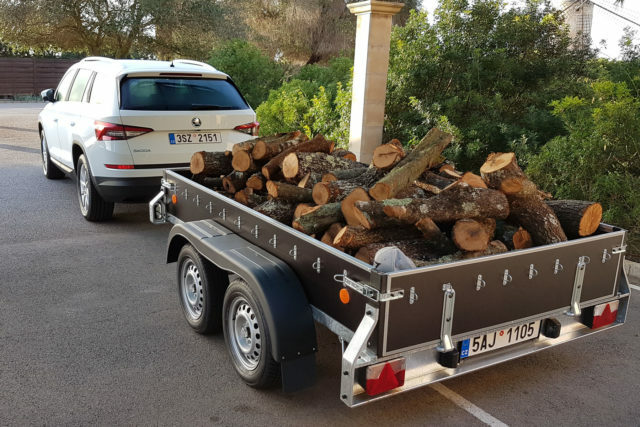 First impressions of the very high-spec Skoda Kodiaqs in Mallorca are very favourable. 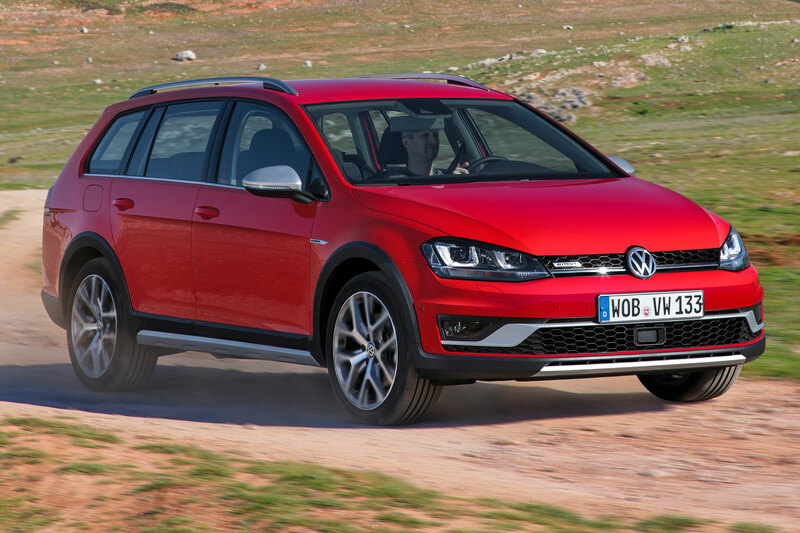 The new SUV looks lower and sleeker than rivals with seven seats, and although this may compromise space a little in the third row of seats, it’s likely to be a good compromise for many. 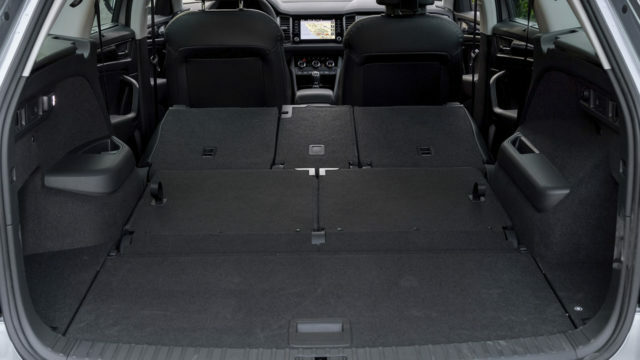 To offset this, the space in the forward two rows is terrific, as is the cargo capacity. You even get a spare wheel. At least, it looks likely you’ll get a space saver, but like a number of things, because the Kodiaq won’t be available in the UK for a few months, the specification hasn’t been finalised. On that point, it will be useful to know how smooth the standard suspension is on our roads, too. Spending £1,000 extra for some fancy springs, like the test cars had, shouldn’t need to be necessary. Yet the competitive prices, nice detailing and enjoyable driving experience should transcend these issues. 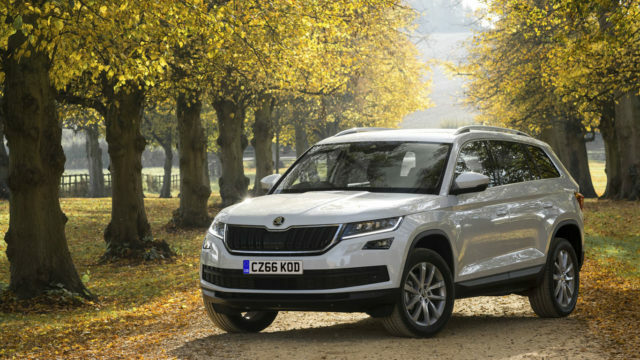 The Kodiaq should be on your shortlist. 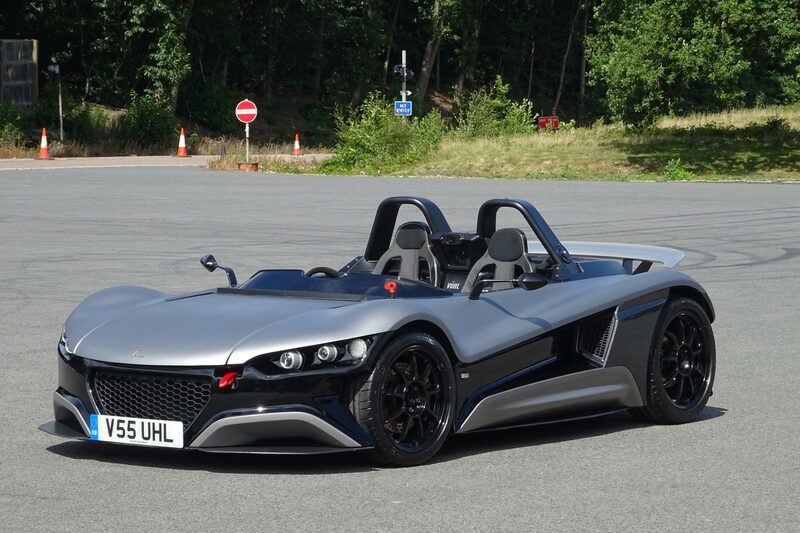 https://www.motoringresearch.com/wp-content/uploads/2016/11/4120.jpg 768 1366 Peter Burgess https://www.motoringresearch.com/wp-content/uploads/2018/12/mr-top-motoring.svg Peter Burgess2016-11-25 10:41:212016-11-25 10:41:212017 Skoda Kodiaq review: just another SUV?